I awoke the next morning feeling a little disappointed. The day before, we had spent all day at appointments, and we’d only checked 1 thing off of our never-ending checklist. I was also frustrated because that day was supposed to be our “free day.” That whole visa system being down thing had thwarted our plans of a day trip to the Taj Mahal. I couldn’t believe that we were going to spend 3 weeks in India, stay just a few hours from this Wonder of the World, and not get to see it in person. I mean, did we really even go to India then? I had to kick myself in the cranky pants and remind myself that we weren’t there to sightsee and that, no matter how perfect the photos in my head of the three of us standing in front of the Taj Mahal might be, that was not the point of our trip. I also knew in my heart that we’d be back in India someday, and a photo with all 5 of us in front of the Taj Mahal would be even better anyway. 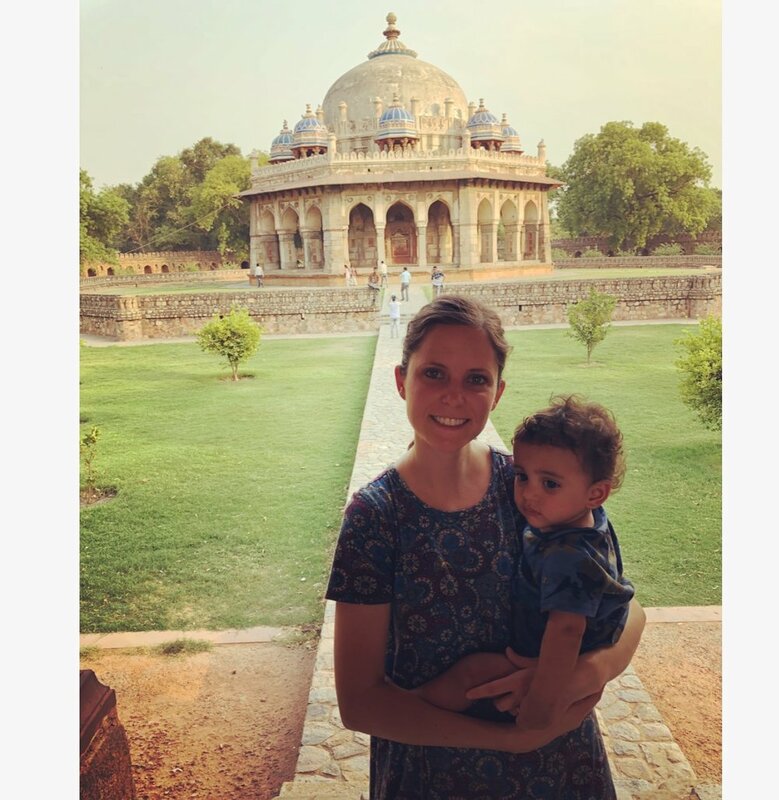 I also had to assume that God knew what He was doing, so we decided that we would make the most of our time in New Delhi....after we (hopefully) received Judah’s visa, of course. It was nice to sleep in a bit and take our time eating breakfast. Our hotel was pretty popular among people completing international adoptions from India, so we were able to meet several other families who had just picked up their children as well. All of them were in that same euphoric state as us, having finally held their children in their arms after months (or years) of waiting. None of them had been in India as long as us. In fact, most of them had only been there a few days and were already completing their exit appointments. Although I was slightly envious of their fast timelines in country, I wouldn’t trade our time in Hyderabad for anything. God had allowed us extra time in our son’s birth city, and we will never forget those treasured memories that we will be able to share with him someday. We also tried to soak up those precious moments of alone time with our son. Once we arrived back home, he’d have 2 older sisters vying for our attention, and they’d never leave him alone again. Gloria called at 10 am, asking if we’d heard anything about the visa. We hadn’t, so she decided to give the U.S. Embassy a call for us. We anxiously waited by the phone to hear her report. We didn’t even need to talk about it to decide that Marcus would be the one going to the U.S. Embassy. While he got ready, I gathered all the documents he might need for this very important errand. Once Gloria arrived, I kissed him goodby and told him to text me as soon as he had the visa in his hands. He laughed and said, “That’s impossible, but as soon as I leave the Embassy and am allowed to have my phone again, I will text you.” I told him that he should probably trade his phone for a poker chip this time. Judah hadn’t slept well the night before, so he was ready for a nap about the same time Marcus left for the Embassy. I rocked him for over 5 minutes before he pushed me away, and I was thankful that he let me rock him without too much of a struggle this time. He had fought it for weeks, preferring to rock himself to sleep because it was what he was used to doing: stimming and self-soothing. Seeing him rock himself for those first few nights absolutely broke my heart - the effects of institutionalized care staring me right in the face, a stark reminder that no amount of money will fix the orphan crisis because children simply belong in families. Those first few nights, we were forced to helplessly watch him rock on his hands and knees and rub his hand and foot on the bed mattress for over 20 minutes before finally settling down. By the time he fell asleep, he was sweaty and exhausted from the nighttime ritual. We had tried to rock him those first few days, but it was too much, too soon for him. He would scream and kick and push us away. Eventually, he would let us lay beside him and rub his back while he rocked himself. We just wanted him to know that we were there and that he didn’t have to be independent anymore. (I know, it’s so backward from what most people are doing with their 13 month old children.) Gradually, Judah would let us rock him for a minute or two before fighting us off and rocking himself again. There were still times where we felt like we were torturing him by trying to rock him as we tried to teach him about love and family and forever. We let him take the lead and eventually, he started to get more comfortable in our arms. Once Judah was asleep, I busied myself by planning the rest of our day. I hoped that this would be our last full day in New Delhi, so I searched the India Adoption group page to find any “must-dos” in Delhi. I tried not to watch the clock, but it was hard not to wonder about the status of Judah’s visa. Finally, I got a text. “I have his visa,” was all it said, but that was all I needed to begin celebrating and to hold onto the hope of seeing our girls soon. Maybe we would be flying home TOMORROW! Could it really be true? We only had 1 thing left on our checklist before it was time to travel, so it was definitely a possibility. Once Marcus returned, I (naturally) checked over everything, and the visa looked correct. We scanned a copy to our agency and ate a late lunch before renting a hotel car for the rest of the day. I had several stops lined up in our itenerary, so Uber wouldn’t cut it that day. Our first stop was Lodi Gardens. We hadn’t seen much green space our entire time in India, so it was a nice change of scenery for us. Even the park down the street from the apartment in Hyderabad was not much but dust and dirt under the metal equipment. Lodi Gardens is a big state park in New Delhi. There are lots of trees, flowers, fountains, a bonsai garden, and some large tombs on the premises. It was very pretty, but it was also VERY hot outside. For a child born in southern India, Judah Mahesh is NOT a fan of the heat. His cheeks get red so quickly. We found some beautiful, picturesque places to take some photos, but Judah gave us that same angry, "over it" look in almost every photo! These photos are pretty funny because this is not at ALL Judah's personality. The boy really just does not like to be hot! Next, we stopped by Khan Market, which was nearby. Honestly, if I could go back, we probably would have skipped it. It reminded me a little of walking around the Plaza in Kansas City, which was not quite what I had in mind. It was a little more upscale than we were looking for, but there were plenty of shops to check out. On the plus side, the air conditioned stores provided some relief from the intense heat. We purchased a small, ornate lion for our trinket shelf and some macaroons before heading out. (Totally things you think of when you picture India, right?) If you’re in Khan Market around mealtime, we hear that you should check out the Blue Door Cafe. After returning to the car, our driver insisted that he wanted to give us a driving tour of the area, so he took us past all the parliament buildings and through the India Gate. It was interesting listening to him talk about all the history of British rule and Independence, and you could tell that he had such pride in his city. We didn’t get out of the car at the massive archway, but our driver made sure we saw this huge war memorial from all sides as well as drive under it. Here’s the best photo we got of Judah Mahesh and the India Gate. Obviously he was feeling photogenic that day. Our last stop was Humayun's Tomb. This tomb was actually the architectural model for the Taj Mahal. It looks strikingly similar to the Taj Mahal, except it is made of red sandstone instead of white marble.....and there are much fewer people there. I think it is just as beautiful! Marcus hilariously referred to it as the Fauxj Mahal the entire time. We explored the grounds and took some photos, which almost made up for our missed trip to the Taj Mahal. Originally we were going to go to Dilli Haat (the real open-market Dilli Haat, not the indoor one that Uber and rickshaw drivers supposedly get a commission for bringing you to instead.) My plan was to shop for traditional clothing, bangles, and other souvenirs there, especially since we ended up in the hospital on what would have been our shopping day in Hyderabad. However, Judah decided that he’d had enough excitement for one day, so we listened to our boy and headed back to our hotel instead. It was probably good, though, because Marcus and I are not very good at negotiating prices, so who knows how much we would have paid for things at that market. I’m sure the vendors would have loved to see us coming, though! On the way back at the hotel, we decided that we’d just shop for souvenirs (and Judah’s perfect homecoming outfit, which I had still yet to find!) the following day before we had to (hopefully) head to the airport. Of course, in order to make our scheduled flight home, we needed to actually receive our Exit Permits first. We went to bed hoping and praying that our permits would be issued the next morning and our checklist would finally be complete. Home was so close that I could almost taste it (and at that point, I really did want to TASTE it).